Moving your family to a new home or a new community can be just as frustrating as it is exciting. There are lots of ways to help the move go smoother. Gathered here are several ideas that should help you keep control of the situation and keep your possessions organized throughout the move. Write everything down! You'll thank yourself later. Before you pack even one box, create a simple record keeping system. Get yourself a spiral-bound notebook and a pen and you can do the job. Place a number on EVERY box you pack and list the contents on your list. Create a place in your home designated as Packing Central. This is where you'll find your labels, marking pens, box tape, and other supplies. When describing the box contents, be specific -- "green every day dishes" rather than "misc. kitchen". You'll need LOTS of boxes--probably more boxes than you think, and having enough boxes will make your life easier! Have about 10 boxes set aside to use for last minute items on moving day, such as bedding, clothing, and cleaning supplies. You'll need strong plastic packing tape to close up the boxes securely. Use unprinted newsprint (newspaper can stain your items), packing paper or bubble wrap to wrap and cushion household good. Again, you'll need a lot more supplies than you think, so get extra so the packing can go smoothly. Clearly label EVERY box with a room name in your new home - dining room, bedroom 1, downstairs bathroom, etc. If necessary, post the name of the room in your new house on the door or doorway. This is helpful for bedrooms and bathrooms so that all helpers will know where to put the boxes and you don't end up with a big pile. If you must clean your old place after moving out, put together a kit of basic cleaning supplies and rags. Clean anything possible ahead of time (the inside of kitchen cupboards, the oven, windows, etc. ), and if possible, vacuum each room as movers empty it. This is where wardrobe boxes come in handy. You can move clothing on hangers straight from your closet to the wardrobe boxes. Clothing in drawers should be packed in suitcases or boxes. Get wardrobe boxes to use for your closet packing if possible. These tall boxes are wonderful for packing coats and clothing. Get things organized as early as possible. A few days before your move, fill some sturdy handled shopping bags with bulky closet items such as shoes, sweaters, belts, and jeans. On moving day, fill the bottom of the wardrobe boxes with some of the shopping bags, then add your hanging clothing. Pack hanging items tightly so things won't move around and fall off of hangers. Finally, cover the shoulders of your clothes (a dry cleaning bag works well), then add a few purses or sweaters on top. You'll have fewer boxes, and closet items remain together. Also, the shopping bags will make it easier to retrieve your belongings from the bottoms of a tall wardrobe box. Fill luggage and duffle bags with clothing, sheets, towels, and paper goods. Even for local moves you'll be able to quickly spot your navy suitcase holding your favorite sweaters, whereas "Box #189" might remain elusive for days. Keep important papers with you. Your list of "important" papers might include: birth certificates, school records, mover estimates, new job contacts, utility company numbers, recent bank records, current bills, phone lists, closing papers, realtor info, maps, and more. Don't leave these with the mover. Keep them with you! Use brightly colored storage tote boxes, one for each person. Let each family member fill theirs with items they'll want 'right away' in the new home -- a set of sheets, a towel, a couple of extension cords, a phone, nightlights, address book, pens and paper, keys, tissues, and travel cosmetic case, and so on. Wrap small appliances in inkless newsprint or your kitchen towels or linens. Tape the bottom of a medium box securely and put down a layer inkless newsprint for padding. You can pack several small appliances to a box. For large appliances, make sure you check your owner's manual for any special instructions before you start to pack. Make sure the inside and outside of all appliances are clean. You can stuff the inside of some appliances, such as washing machines and dryers, with towels or linens. Tape down any parts that could come loose -- the burners on your stove, the electrical cords, etc. Wrap the appliance with furniture pads and tie securely. Put Corrugated Corners on and wrap each piece in bubble wrap. Pad the bottom of a large box with crumpled inkless newsprint. Give the items plenty of space, and make sure you add lots of packing material on the sides, between items and on top. Remember to label the box "fragile." Use only small boxes for books -- they get very heavy, very fast. You can use small paperbacks to fill the sides of the box if there is extra space. Ideally, you should pack electronic equipment such as stereos, TVs and computers in their original boxes with their original packing material. If this is unavailable, wrap the equipment in plastic bags. Wrap each piece in bubble pack and pack in a heavy duty TV Box. If you can take your furniture apart in any way to make it easier to move, make sure you put all nuts, bolts and screws in a small zip-lock bag and tape the bag to the furniture. Tape drawers shut where necessary. Wrap exposed legs (on tables and chairs) in bubble wrap or inkless newsprint. Wrap in furniture pads and tie securely. 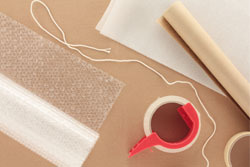 Wrap breakable items in bubble wrap or inkless newsprint. Put layers of bubble wrap between each plate or bowl. Fill the top bowl with crumpled inkless newsprint. Make sure you put the heavier items on the bottom of the box. Wrap non-breakable items in inkless newsprint before packing in a box Use cell packs to separate delicate items. Make sure you pack all the items you'll need for your first few days in you new home in one box, and label it prominently. You can only eat take-out for so long. Tape an X of masking tape across mirrors and paintings framed with glass. Wrap each item in bubble wrap. You can use our shipping cartons for these pieces. Make sure you label everything fragile. Moving may not be the most fun you've ever had, but planning ahead will go a long way toward making the process bearable.